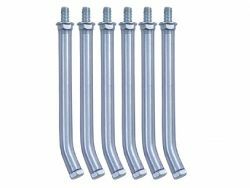 Heavy duty threaded brackets to use as an alternative to peg hooks. Brackets thread into the rail and lock in position by tightening down the jam nut. Vinyl covering protects the finish of the tool when hung.